This level has medium difficulty and you need to use good trick to complete this level. For this level you should try to play near to blockers that are in bottom or play where you have same color candies to get special candy. 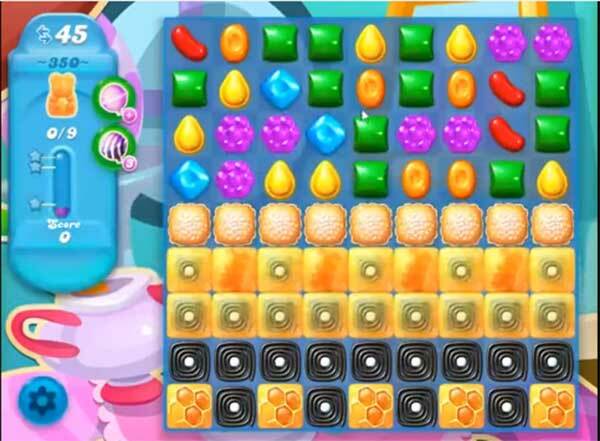 Try to combine special candies to each other to break more blockers and honey to save the bears. after quite a while passed this diabolical level. Been on this level a month. Level 350 is impossible. Am done with this game. This level is impossible. I feel like person that said it supposed to be fun , not aggravating. The very first time I did this level, I left only one bear. I haven’t gotten anywhere near close to that since ha ha. But the last time I said a level was impossible and I thought about quitting, I did finally get through. I’m not going to let this level beat me either. Don’t give up! It’s not just skill, it’s luck. I completed this game then it froze did not get credit, so i played again and won, game froze again did not get credit, was mad as he–. Now game is boring dont enjoy a game that is no fun. This game is do darn frustrating and they don’t give you much credits for the levels you work hard yo get. I pretty good at all the levels, they are making it impossible to beat this level because they want you to spend your money. Let’s all take a stand and all quit their game. I can get 6 or 7 of the bears, and one time I even got 8 bears. But I just can’t get the 9th bear. This level is driving me nuts. You need to make these level a little easier to do.